TORONTO, ON – April 7, 2016 – Technology and data company Engagement Labs, creator of eValue Analytics™ score, today released rankings of the top performing U.S. colleges and universities on social media according to eValue data. The colleges and universities examined included those categorized as Ivy League, for-profit and those within the following NCAA conferences: the Big Ten, the Big 12, the ACC, the Pac-12, and the SEC. On Facebook, Baylor University was the leader with the highest eValue score. The university also had the highest Engagement score due to posting high-quality content revolving around its football team and campus, which enabled its followers to interact. Additionally, Baylor generated the highest number of comments and likes per 1,000 fans and had the most active user base of the top ten. According to Engagement Labs’ eValue score, Texas A&M University placed second overall and had the highest amount of overall likes and comments. Ashford University, which ranked third overall, had the highest Responsiveness of the group. On Twitter, University of Wisconsin-Madison ranked first for overall eValue score and boasted the highest number of retweets and favorites per 1,000 fans. 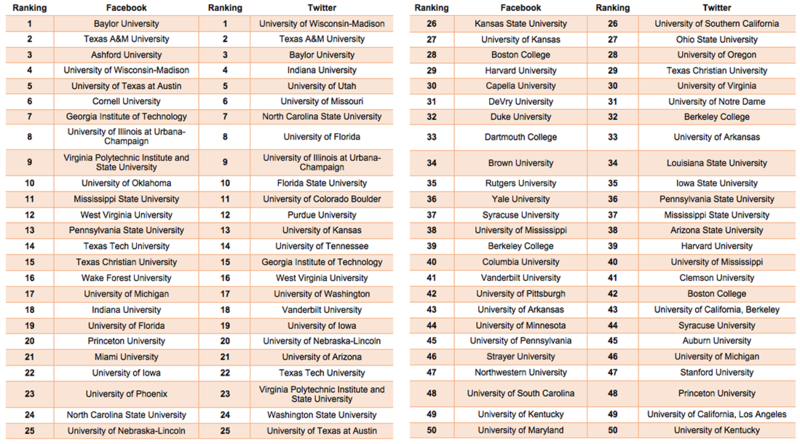 Texas A&M University ranked second on Twitter with the highest Impact score and the highest follower growth of the top ten, with 25,515 new followers during the time period measured. The highest Engagement score of the top ten was secured once again by Baylor, which placed third overall, thanks to a content-focused strategy similar to their Facebook channel. Fifth place finisher University of Utah scored the highest Responsiveness and response rate of the top ten. “Engagement may be high across both channels, but the lower Responsiveness scores - particularly on Twitter - showcase a need for these academic institutions to place more emphasis on their response strategies to participate in two-way communication. Followers are turning to these channels for answers regarding topics such as academic needs or campus life, so providing the requested information via social is essential to the promotion of their brand. Overall, an effective response strategy helps build relationships with students, prospects and the community-at-large,” noted Segal. Engagement Labs offers intelligent data, analytics and insights for marketers and organizations to track, measure and benchmark the conversations happening around their brand or industry, both online and offline. These conversations are proven to drive critical business outcomes, including sales, while Engagement Labs’ tools provide the data and actionable insight to help guide business decisions and power marketing effectiveness. To learn more visit www.engagementlabs.com / www.kellerfay.com.